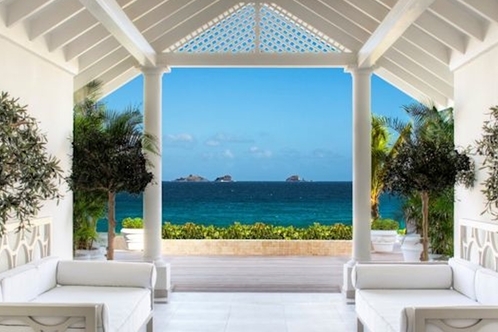 THE CHEVALBLANC portfolio has a new addition to its luxury thoroughbred stable; Cheval Blanc St-Barth Isle de France, which opens on October 15. St Barts* has long been the favourite playground for the sand-between-the-toes jetsetters. So Cheval Blanc is the perfect Maison for the fabled island. Hotel Saint-Barth Isle de France was acquired by LVMH in 2013 since then it has been groomed to perfection to be relaunched for this season, with further luxury enhancements planned for 2015. Along with Eden Rock the legendary hotel is the island's - if not the whole Caribbean's - most ritzy stay. So it is fitting that it comes under the exclusive Cheval Blanc blanket. This will be the third Maison in the portfolio, joining Cheval Blanc Randheli in the Maldives, which (opened in November 2013) and the sublime Cheval Blanc Courchevel, the ski-in ski-out Maison in Courchevel 1850. Interior design-wise there is plenty of the hotel's trademark blue on view as well as Cheval Blanc Taupe and splashes of bright blush pink, to reflect the blue waters and the bright tropical Caribbean flowers. There is also new bed linen in white cool cottons with pink touches. Cheval Blanc's intention is to "fuse West Indies charm and French savoir-vivre in an elegant yet laid-back spirit" and we've no doubt they'll achieve this. How could they not with that idyllic Flamands bay setting (which has to be one of the best beaches in one the Caribbean) and all the cheval charm. Expect the exclusive services of a Majordome (Butler) in the one-bedroom Beach Suites and Flamands Villas. Tailor-made experiences and activities are also crafted by the Maison's Alchemists (love that description). The Alchemists can turn every day to gold. Take the Big Blue Escape for example, where guests are escorted aboard a sleek yacht to discover St-Barts' most gorgeous bays. There's even accustom Maison beach bag waiting aboard with panama hats, fans, sun lotions and other beautiful treats (it's the little things). Guests will drop anchor for a fresh lobster lunch, swim in hidden bays and returned with a golden, sun warmed glow. See, alchemy. Executive Chef Yann Vinsot's La Case de l'Isle is still one of the island's most sought-after spot for lunch or dinner. And the poolside White Bar and La Cabane de l'Isle, provide the relaxed dining and cocktails. There is also a new look for the Ambassadeurs, inspired by all that glamour of St-Barts in its 1950's and 60's, heyday. There will be plenty of pampering at Cheval Blanc with the spa offering the only Guerlain treatments in the Caribbean (Guerlain is also on offer at the other two Cheval Blanc Maisons). TLTB especially like the sound of the St-Barth Solar Escape, a soothing skin treatment for sunbathing Caribbean beach belles. The belles will also be pleased to know that the Maison's has partnered with French hair pioneer and groomer of celebrity tresses, Leonor Greyl to develop a nourishing product line for Cheval Blanc that protects hair from its exposure to sun and sea. Bathing belles can also spray themselves Tropical Chic, a new fragrance developed especially for the resort by Thierry Wasser from Guerlain. As if that weren't enough, a new fitness centre overlooking Flamands Bay will open October 2015, offering personal training sessions and the latest Technogym equipment.